Some new threads - Stop staring and start sewing! My little sewing machine store is closing today and I'm really going to miss them. It's the sweetest little mom and pop store and I've been on a first name basis with everyone since I starting handing over my hard earned cash to them. They like me. Anyway the owner Leonard is a spunky little Sicilian man who has been extra kind to me since I have a Sicilian last name. Unfortunately he had a heart attack last month and is very blessed to have survived but is no longer up to the task of running the business. I really like him even though he did make it a point to let me know that I've been mispronouncing my last name for the past 21 years. At least I can spell it finally, and that's what really matters. 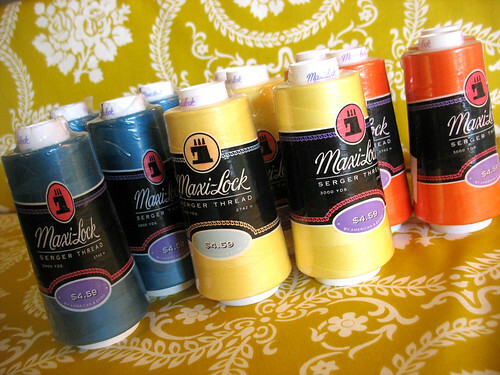 So I stopped by today to say goodbye and helped them clean the store out by buying off some of their thread in these pretty, perky colors. Definitely a nice addition to my collection and they're nice to look at when I'm not using them (see, dual purpose). I'm really going to miss that place. Speaking of stores (sloppy segue I know) this is my favorite print from Jennifer Paganelli's Sis Boom Basics line. I adore this golden yellow color. I will be receiving another shipment from Free Spirit soon (Sun Drop by Dena) and it's gorgeous too! My goal is to have Fabritopia up and running by March 1st and I'm already having anxiety dreams about having zillions of customers frothing at the mouth wanting to order from me and of course I will run out of stock the first day and then what??! Maybe I should relax?